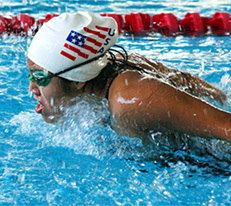 Growing up in South Central Los Angeles, 15-year-old deaf swimmer Jazmin Hernandez has one dream: going for gold at the Deaflympics. While charting Jazmin's training, victories, and setbacks, directors Amanda Salem and Stephen Fell offer us a different kind of film about sports, one that avoids the stereotypes of a typical sports documentary and asks thoughtful, nuanced questions without easy answers: What's it like to grow up deaf in a "hearing" world? Can a talented, deaf athlete have a "normal" childhood? And ultimately, what are the hidden costs, rewards, and life lessons of competing at one of the most unique sporting events in the world. Nicole Opper is an Emmy-nominated filmmaker who directed and produced the feature documentary "Off and Running," which was nationally broadcast on P.O.V. in 2010 and won an Audience Favorite at Tribeca and a dozen international awards. Her latest documentary, "Visitor's Day," for which she received a Fulbright Fellowship, screened at Rough Cuts in November of 2014. In June, the film will world premiere at AFI Docs. Nicole has produced films for The Discovery Channel and Here TV, and was selected for Filmmaker Magazine's annual "25 New Faces of Independent Film" in 2009.